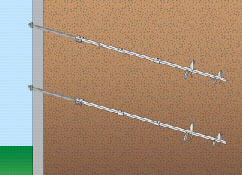 Helical wall tiebacks are foundation lifting devices designed to straighten or strengthen basement and retaining walls. This method of shoring has become very popular with the engineering community, due to their strength and ease of measuring capacity. A helical wall tieback has many of the same benefits as other helical anchors in the fact that they install with lightweight, portable equipment, are not adversely affected by weather and can be load tested immediately upon installation. Tiebacks are horizontally aligned structural elements that provide lateral reinforcement to retaining walls. These technologies apply to projects ranging from small basement walls to large commercial projects including bulkheads or temporary and permanent earth support. Earth Support: Tiebacks are pre-engineered systems that can resist large forces immediately. Helical tiebacks can easily hold loads of up to 150 kips (kilopounds). At Tar Heel Foundation Solutions we can utilize helical tiebacks to support your cracked, bowed or leaning foundation and retaining walls. How Does a Helical Wall Tieback Work? First, a small hole is cored through your foundation or retaining wall. Galvanized steel helical anchor sections are hydraulically screwed out through your foundation or retaining wall into the soil while torque is monitored to achieve capacity. The amount of torque produced by the helical anchor correlates to the load the helical anchor can carry. Once appropriate distances and capacities are reached, a wall plate is then secured to the foundation or retaining wall. Once all components are connected and tightened, your foundation or retaining wall is permanently stabilized. Contact us today and we can advise you on the best method of repair for your foundation problem.